Good bye winter. Spring is in the air. We still have some snow. Very busy winter. 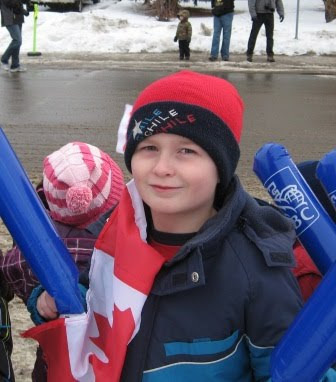 We got to see the Olympic flame go through our town. How proud I am to be Canadian. It was great fun to watch it all on TV. I found all the flame carries practicing in front of one of the schools. I stopped and got a great group photo of all of them. One of the kids goes to my older son's school. I understand the school council brought the touch for him to keep. 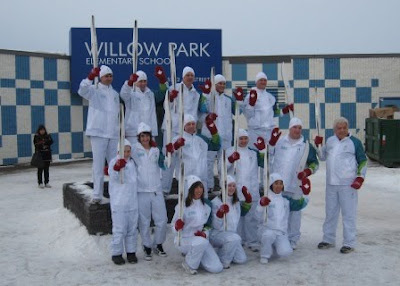 The flame went past many school in Leduc and if it did not go by a school they bussed the kids to a place on the flame path. It was quick and fast but it made us feel apart of the spirit. 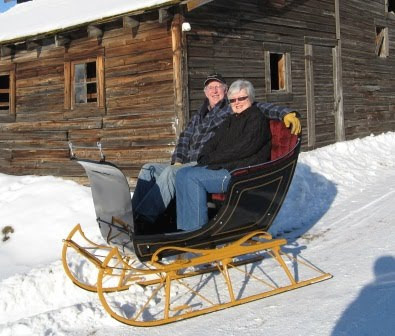 This is my parents sitting together in our horse sleigh. It was bought over 90 years ago by my grandfather for his mother when they moved to Alberta. I first saw it in my uncle's barn loft when I was about 8 years old. Two years ago my dad sent it to be refurbished and this is the day it came back home. One trouble - we do not have a harness horse to pull it. Maybe when I start having trouble getting on my horse I should get a harness horse. My family would laugh at this statement - my horse is tall and I already have trouble getting on without a big step. At least my horse stands still nicely for me.